The Holywood idol’s damaged right wrist was strapped up like a boxer’s as he went 18 holes with heavyweight Atlanta Athletic Club on another scorching Georgia day. But while he was battered and bruised on the greens as he took 34 putts in a three over 73, he made the cut with shot to spare and insisted he can still make a weekend charge and chase clubhouse leader DA Points who post a 67 to lead on four under par. Confessing that it was mental rather than physical torture, Rory said: “More than anything else, it’s just tough to get the wrist injury out of your head. “It was a frustrating day to say the least. You are trying to protect it through the shot and it’s frustrating because sometimes you feel as if you try to play a shot and just come out of it. “I thought about pulling out a couple of times yesterday when it was feeling pretty bad. But I got some treatment on it last night and again this morning, and it felt stiff when I woke up but loosened up a bit. McIlroy arrived with a splint under heavy bandaging after visiting an Atlanta outpatients clinic overnight for treatment from a string of doctors, hand surgeons and orthopedic specialists. He said: “Yesterday, on the course, there was probably a couple of points where I thought it might have been better to walk in. “But I wanted to play through. I was 1under through 12 holes, so I thought I’ll just try and see it off to the end of the round. An MRI scan revealed that he had strained the flexor muscle in his forearm but hadn’t suffered a serious injury and couldn’t make it any worse. He took anti inflammatories and pain killers shortly before the start and could need between two and six weeks to recover when he flies home to begin his recovery. Describing himself as 70-75 percent fit, he confessed that in hindsight it was a mistake to try and hit that risky seven-iron from behind a tree root on the third hole in Thursday’s opening round. But he doggedly defended his caddie JP Fitzgerald to the hilt after the bagman was criticised (though not named) by the Golf Channel for failing to step in to talk him out of the shot that could have led to a career-threatening injury. McIlroy stretches his arm on the 16th. Picture by Fran Caffrey/www.golffile.ieRory said: “Looking back on it and how close the root was to the ball, it probably wasn’t the right decision. But I felt at the time that if I could make impact, let go of the club, I could have got it up somewhere around the green. “In major championships, every shot counts, and that’s all I was really thinking about. We talked about chipping it out, and you know, in hindsight it was probably the better option. Asked if Fitzgerald should have stepped in, McIlroy lost his patience with a reporter who tried to point out another attack on Fitzerald. “He’s my caddie, not my father,” he said, shaking his head. Chandler should know. He said less than an hour after McIlroy’s US Open win that there was no way that the 22-year old would be re-joining a PGA Tour that requires players to commit to 15 events. Within seven weeks McIlroy showed him who’s really boss by indicating that he’s heading back to the US next year. Starting on the 10th, he opened with a three-putt bogey from 25 feet before holing from 12 feet for birdie from the fringe at the par-five 12th to get back to level par. But he then missed a six foot chance at the 13th, a 10 footer at the 14th and a 12 foot chance after a brilliant approach to the 236-yard 15th before a 40 footer hit the back of the hole at 16th, hopped into the air and drop to move him into red figures at one under par. He looked in danger of missing the cut when he triple bogeyed the 211 yard 17th by splashing his six iron into the lake and then three putting from 30 feet. But he steadied the ship to play his back nine in one over par and make the weekend with ease despite playing with just one good hand. After holing a 15 footer for par at the second, he bogeyed the third by leaving a bunker shot in the sand and then three-putted for a par five at the fifth after racing a 35 foot eagle chance eight feet past the hole. Bothered by his strapping and worried about doing further damage to his hand, he then followed a birdie at the sixth with a bogey at the eighth. Scheduled to reappear in the Omega European Masters in three weeks, McIlroy will work with his UK-based physio Steve McGregor to get back to full fitness. He said: “It would have been great to play here injury-free. I would have started to wind it down a bit for the season and work on a few things leading into next year. Rory McIlroy tees off at the 11th in practice. 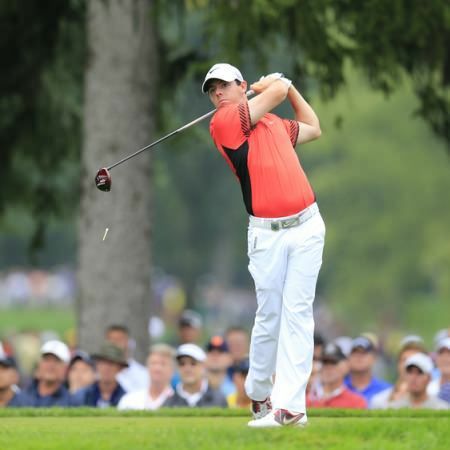 Picture Fran Caffrey www.golffile.ieAmerican idol Rory McIlroy wants to do some heavy lifting in the US PGA that will leave stablemate Lee Westwood light on major wins. The pair want to hoist the 27lb Wanamaker Trophy on Sunday night but while Westwood is the king in the gym, US Open champ McIlroy reckons he’s got some major power on his side - the US crowd.